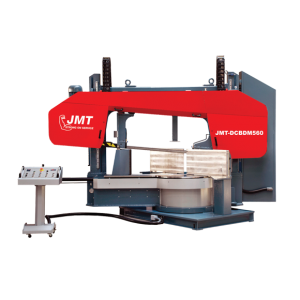 If your requirement is a semi-automatic band saw, JMT has the saw you need. With every conceivable design concept covered, whatever you cut will have met it’s match with this lineup of JMT’s latest semi-automatic saws. At the smaller end of our offering is the HBS series which is a horizontal pivot style band saw that miters one side from 90 degrees to 30 degrees with stops at 60 degrees and 45 degrees. Capacities range from 11 inches at 90 degrees to 13 inches at 90 degrees. Moving up in capacity JMT offers the DCBM single sided miter saw. This is a twin column design that miters from 90 degrees to 30 degrees with stops at 60 degrees and 30 degrees. These machines range from 18 inches at 90 degrees to 43 inches at 90 degrees. For those customers that require a band saw that can miter on both sides, JMT offers the DCBS twin column band saw that miters from 90 degrees to 30 degrees with stops at 60 degrees and 30 degrees. For those customers that do not require a larger band saw machine, JMT offers the WV horizontal pivot style that miters on one side from 90 degrees to 30 degrees with stops at 60 degrees and 30 degrees. These machines range from 10 inches to 11 inches in capacity. With the use of meehenite cast iron in all our band saws, it has but one single purpose, to improve the band saw machines stability. Vibration is the number one cause of shortened band saw blade life. Another benefit of a more rigid platform is the reduced cost of maintenance as all the moving parts last longer. A more ridged also produces a more accurate better surface finish. Stability has to be engineered in, it can’t be added on.